Torrance, CA - The Law Offices of Edward J. Deason are seeking any information from individuals who have been struck by errant gold balls on or around the premises of the Brookside Golf Club near the Rose Bowl in Pasadena. On September 30, 2011, a 22-month-old child was struck in the head by a golf ball that came over a fence at the Brookside Golf Club. The injury occurred while the mother was pushing her child in a baby stroller on a walkway by West Drive and Salvia Canyon Road. The child suffered a head injury causing a brain bleed and traumatic brain injury. The golf course operator and the City of Pasadena claim they were unaware of any history of golf balls striking pedestrians and cyclists in the area of the accident. The Law Offices of Edward J. Deason represent the mother and the injured child. They are reaching out to locate any individuals who may have been struck by golf balls that came over the fence from the Brookside Golf Club. They are interested in whether the golf course was informed of any such event. The public is encouraged to raise this issue with the City of Pasadena, which owns the Brookside Golf Club and the surrounding fences, pedestrian walkways, and streets. The public uses these walkways and streets and would be better protected if additional safety nets were erected where golf balls are known to be hit outside the golf course. Please contact Edward J. Deason at (310) 792-2175 or send him an email at ejdeasons@verizon.net if you have any information on this issue. By locating other victims of golf ball injuries, Mr. Deason hopes this will help the mother and the injured child’s case and compel the City of Pasadena to implement better safety precautions to prevent these types of injuries from occurring in the future. Did you know the average speed of a golf ball ranges between 100mph to 150mph, with much greater speeds when professional athletes are involved? 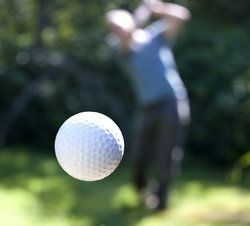 The velocity of the golf ball will change as it travels through the air, but the impact of the golf ball given its rate of speed can be substantial. If struck in the head or face, major injuries to the brain, fractures to the cranium, damage to facial features, and even death are all possible. These issues are compounded if the victims are young. It is estimated that one-quarter of all golf-related injuries affect children between the ages of 5 and 14. A brain injury, facial injury, or cranial injury at that time can be devastating since the child is still growing and thus, especially vulnerable to permanent disabilities. Given that the Brookside Golf Club is a public golf course, it is important that the City of Pasadena be held accountable given their obligation to the public to ensure safety. By bringing victims’ stories to the attention of city officials, positive change can occur that can improve safety standards on the premises.